MAESTRO can interface directly with NAPA in order to leverage existing geometry and loading information. 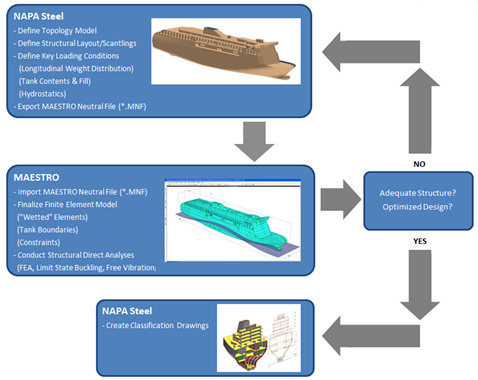 The NAPA/MAESTRO Interface (NMI) module allows the designer to import a NAPA/NAPA Steel 3D model, which includes the finite element model (geometry, scantling properties, and finite elements), loading information (longitudinal weight and bending moment distributions, tank boundary, content, and fill definitions, and hydrostatic equilibrium definition), and model hierarchy definitions such as MAESTRO module groups. 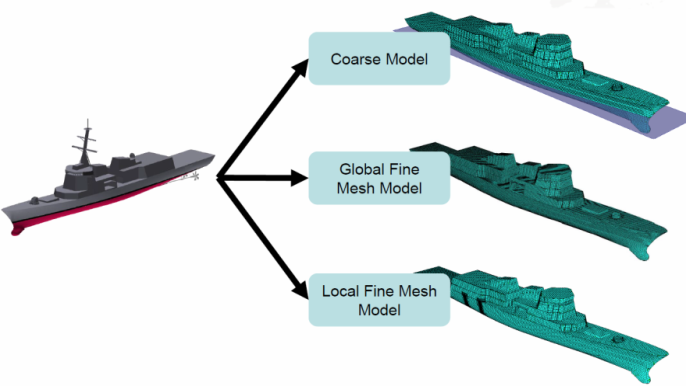 This interface enables shorter design cycle times by using a single 3D structural design model (from NAPA) that can be re-used as the design matures and is ready for MAESTRO analysis in a matter of minutes.